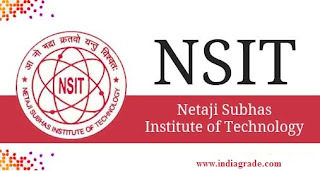 NSIT 2016 Application Form: Netaji Subhas Institute Of Technology (NSIT), New Delhi invites application form from the eligible candidates for the admission of various UG engineering like B.E, B Tech & B.Arch degree courses. If the candidates want to get engineering seats in the Netaji Subhas Institute Of Technology, then they should apply for the NSIT online registration 2016. The direct link to register for NSIT Application Form 2016 is available below. NSIT B Tech admissions will be done on the basis of performance of candidates in JEE Main exam 2016 and then counselling will be conducted by JAC Delhi. NSIT 2016 Online Registration for candidates is allowed only in first round of counselling and no fresh registrations will be allowed in other subsequent rounds of counselling. For Delhi Region Candidates (85% of seats): Candidates passed in HSC / 10+2 exam form a recognized university within the National Capital Territory (NCT) of Delhi with 60% marks in Physics, Chemistry and Mathematics. For Outside Delhi Region Candidates (15% of seats): Candidates passed in HSC / 10+2 exam form a recognized university outside the National Capital Territory (NCT) of Delhi with 60% marks in Physics, Chemistry and Mathematics. Age Limit: 17 years to 25 years of age as on 1st November 2016. All candidates who are seeking admission to all engineering & architecture programmes at NSIT are required to visit website www.jacdelhi.nic.in. Then you need to pay the counselling fee deposit money of rupees 1100/- by Credit / Debit Card / Net Banking and e-challan. After payment, candidates are required to visit the website once again and fill online registration form.